Bonjour! Hallo! Guten Tag! Ciao! Moi! If you’re a travel junkie, this is the wedding invitation for you! Backpackers and explorers alike, show off your penchant for foreign soil and send your guests an invitation that matches your personality and travelling dreams. This range of Vintage Travel Design wedding stationery from Knots and Kisses is perfect for those of you who are either getting married abroad, your spouse is from lands afar or if you’re planning on jetting off on honeymoon to somewhere that will make everyone absolutely jealous. It’s reminiscent of Air Mail envelopes and oozes a unique, antiquated feel that will be sure to grab the attention of your guests. Creative flares such as the two postal stamps, including Paris’ oh-so romantic Eiffel Tower, add to the charm of this eccentric design. 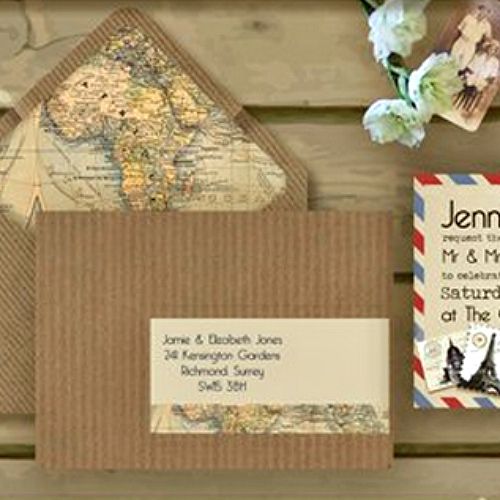 With lots of options to choose from, including luggage tag-style place cards and gorgeously designed envelope liners that feature a section of a vintage world map, you can be sure that your wedding stationary needs will be stylishly catered for. Most of this range has been cleverly designed in a postcard style, adding to that ’travelled feel’. Printed on 300gsm card that looks aged and well-travelled itself, you can rest assured that your stationary won’t be received as a wallflower, run-of-the-mill wedding invitation, oh no! Your’s will certainly stand out from the crowd! 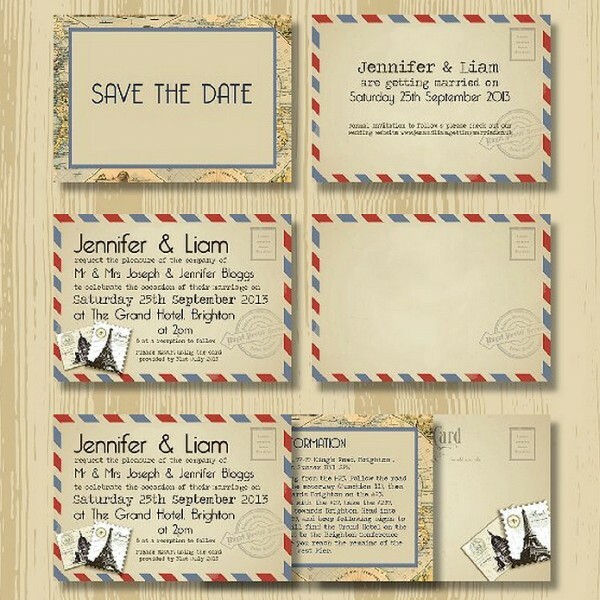 The finer details really have been carefully considered (even the little strip of map on the optional address labels) – if you’re looking for wedding stationary that is coordinated, fun and quirky, look no further! Tags: Map, Shabby Chic, Victorian, Whimsical.